New Delhi, Feb 12 (UNI) Glowing tributes were paid to former prime minister Atal Bihari Vajpayee after President Ram Nath Kovind unveiled a portrait of the late BJP leader in the Central Hall of Parliament at a joint sitting attended among others by Prime Minister Narendra Modi, Vice-President M Venkiah Naidu, Speaker Sumitra Mahajan and Leader of Opposition in Rajya Sabha Ghulam Nabi Azad. The Central Hall, which is the famous venue for the meetings of the Constituent Assembly to frame the Constitution, burst into applause as the President unveiled by remote control the portrait donated by Lok Abhiyan Sanstha and done by artist Krishna Kanhai. The artist was facilitated on the occasion. Describing it as a ``historic occasion’’, the President said Vajpayee will always be remembered as an Indian statesman who was an example of dignity in public life and patient perseverance in adverse situations. The Prime Minister recalled Vajpayee as a ``great communicator’’ whose silences were as powerful as his speeches. ``When to speak and when to be quiet, was his extraordinary quality,’’ he said. Mr Modi said one needs to learn from Vajpayee that in democracy there are no enemies, only political rivals. ``He saw a lot of ups and downs during his political life but did not compromise with his principles which brought results after some time. We ordinary workers learnt a lot from him,’’ the Prime Minister said. On his part Vice-President M. Venkiah Naidu, who is also the Chairman of Rajya Sabha, expressed his concern at the deteriorating level of political discourse. ``These days level of political discussion is going down. Political parties are not enemies, only rivals. They must discuss, debate and decide rather than disrupt—that will be a great tribute to Atalji,’’ he said. Describing Vajpayee as a ``great administrator, politician, orator, parliamentarian, Prime Minister and above-all, a great human being’’, he said ``he was a role model to all people in public life’’. ``Be tolerant towards others’ views and respect the mandate of the people,’’ he added. 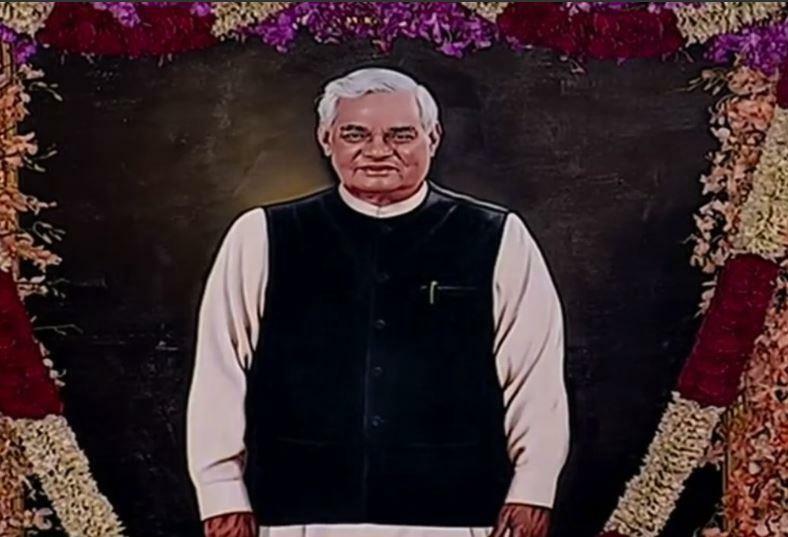 Addressing the joint sitting of members of Parliament, Ms Mahajan, said it was a matter of ``great pride’’ for her that she headed the panel that decided to put up Vajpayee’s portrait in the Central Hall. The portrait is placed next to that of freedom fighter Lala Lajpat Rai. The Speaker thanked the committee members, who are drawn from different political parties and said that the moment the proposal was made, ``all agreed unanimously’’. She said that even while being in Opposition, Vajpayee would convey his opinion without rancour against anyone. Mr Azad said Vajpayee would be remembered for his speeches and for not holding anger against anyone. Mr Azad quoted from Vajpayee’s speeches to say that the former Prime Minister, even while attacking the policies of the government of the day in 1997, said that 50 years’ of progress could not be negated. ``He also spoke against divisive politics in the name of religion and case and said `if India was not secular, it cannot be India’, ‘’ said Mr Azad. Mr Azad was a member of the 13-member Parliamentary Committee on Installation of Portraits of National Leaders and Parliamentarians chaired by Lok Sabha Speaker, that took the decision in December 2018, to install a portrait of Vajpayee in the Central Hall. Vajpyee's family members including his daughter, son-in-law and grand-daughter were present on the occasion. Vajpayee was the Prime Minister of the country thrice. The first two terms were curtailed but he served full term from 1999 to 2004. He was the founder of Bhartiya Jana Sangh which was merged into Janata Party in 1977. He was among the founders of the Bhartiya Janata Party. He was born in Gwalior on December 25, 1924 and died in New Delhi on August 16, 2018.